Now that you’re considering Malaysia a country to study abroad, next you need to find out what options you have and which courses or university would suit you best. Besides an overview of the higher education system in Malaysia, you will be introduced to the types of higher educational institutions in Malaysia and what you need to know before applying to a college or university. Let’s begin by getting to know the education governing authorities in this country. The Malaysian education structure can be divided into pre-tertiary and tertiary education levels. The former is governed by the Ministry of Education (MOE) (or Kementerian Pendidikan Malaysia in Malay) while the latter comes under the Ministry of Higher Education (MOHE). Previously, education came under only one ministry, namely, MOE. In 2004, MOHE was created to manage the higher education sector which was fast expanding. Subsequently, both ministries were merged in 2013 to facilitate the smooth implementation of the Malaysia Education Blueprint 2013-2025. On 28 July 2015, the government once again reestablished MOHE. The Education Act 1996 covers pre-tertiary levels of education under the national education system which comprises preschool, primary, and secondary education as well as post-secondary education. The other eight acts regulate the provision of higher education in Malaysia. Why is education legislation important? Legislation in education is important to you as it helps protect your rights as a student. It provides a framework to regulate how HEIs are run. It also assures the quality of education and qualifications you receive (and pay for). Essentially, it protects the rights of students like you. Malaysia has a well-defined internationally recognised qualification framework. The qualifications awarded by all approved HEIs in Malaysia are governed by the Malaysian Qualifications Framework (MQF). The Malaysian Qualifications Act 2007 provides for the establishment of the Malaysian Qualifications Agency (MQA) whose main role is to implement MQF. MQA is an internationally recognised qualification assurance body, and a member of the ASEAN Quality Assurance Network (AQAN) and other networks; while MQF benchmarks against the standards of the UK, Australia, New Zealand and Europe (Bologna process and EQF). MQF specifies the minimum number of credits required for each level of programme. That means that students needs to achieve the following minimum number of credits (indicated in brackets) before an academic qualification can be awarded to them by the higher educational institution at which they are studying, e.g. certificate (60 credits), diploma (90 credits), bachelor degree (120 credits), and taught master degree (40 credits). Master and doctoral degrees obtained by research do not have credit values. Launched on 7 April 2015, the Ministry of Education developed the Malaysia Education Blueprint 2015-2025 (Higher Education) or the MEB (HE) with the aim of evolving in order to stay abreast of global trends in education. Through its system aspirations and 10 shifts, the outcomes of the Blueprint will benefit all higher education students in Malaysia, both local and international. Efficiency - to maximise the return on investment in higher education and to maintain the current levels of government expenditure per student across public institutions; and to rise from 44th out of the 50 countries in the U21 output ranking that covers research, enrolment, and employability to be in the top 25 by 2025. 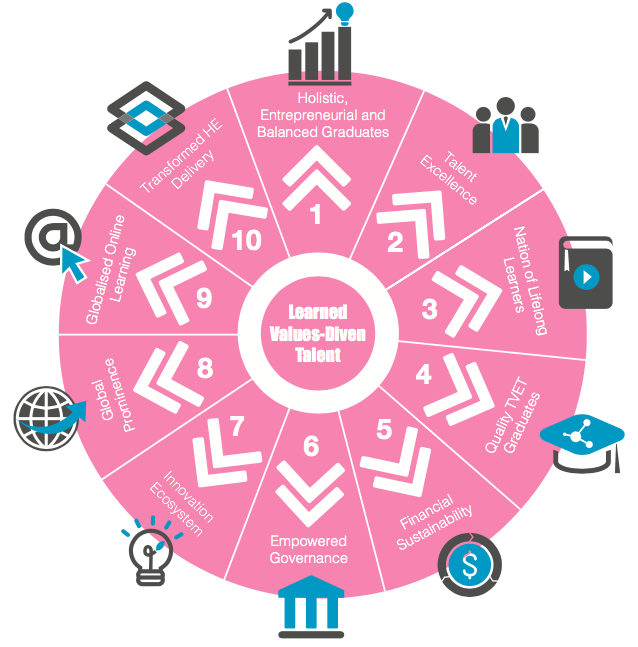 To achieve these aspirations as stated in the above, the MEB (HE) outlines 10 Shifts that will spur continued excellence and transformation in the higher education system. To develop holistic, entrepreneurial and balanced graduates in line with the National Education Philosophy who can contribute towards the betterment of the family, society, nation and global community. These qualities are re ected by six primary attributes – ethics, and spirituality, leadership skills, national identity, language pro ciency, thinking skills and knowledge. To develop an academic community that is relevant and respected in both the local and international community by to attracting, developing, and retaining excellent talent both locally and internationally. To make learning and relearning an integral part of the Malaysian way of life through a well-coordinated, high quality lifelong learning system; and by establishing learning communities in every organisation. To be a premier higher education TVET provider that develops skilled talent to meet the growing and changing demands of industry, and promotes individual opportunities for career development. To develop a portfolio of fully- autonomous and semi-autonomous HLIs that can operate freely within the regulatory framework established by the government. To facilitate the development of innovation ecosystems in a few national priority areas through new collaboration models across academia, industry, government and community, in order to fuel the nation’s economic growth. To develop Malaysia as an international education that is valued by students for its competitive advantage in providing value for money higher education and that balances quality and affordability with the added value of rich cultural experiences. A target enrolment of 200,)00 international students by 2020 and 250,000 by 2025 is the aim. To be a premier education hub through GOL by increasing the of quality education for Malaysians and the global community. To transform the higher education system beginning with the transformation of the Ministry through transparent delivery, with effectiveness and ef ciency levels comparable to that of the private sector. Subsequently, the Ministry seeks to catalyse transformation among private and public HLIs. All these transformation efforts will benefit local students and international students as well. Higher education enrolment has increased over the years. 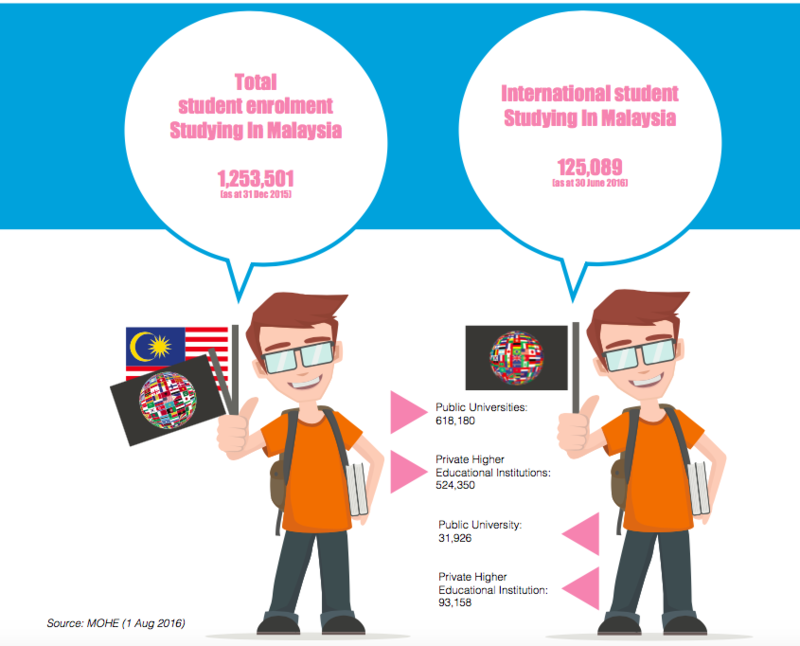 Do you know how many students are pursuing higher education in Malaysia in 2016? MOHE is directly responsible for the operation and performance of public HEIs, whereas private HEIs are guided by MOHE’s policy guidelines and objectives. Public universities are fully funded by the government and are governed as self- managed institutions. They offer mainly bachelor degrees and postgraduate programmes, with some offering programmes at diploma level and foundation levels. There are 20 public universities in Malaysia, with at least one in every state. Public universities generally have a larger campus and student enrolment; and offer a wide variety of different elds of study. These universities can be divided into ve research, 11 comprehensive universities and four universities specialised technical universities (MTUN). The ve public universities that have been designated as research universities are Universiti Malaya (UM), Universiti Putra Malaysia (UPM), Universiti Kebangsaan Malaysia (UKM), Universiti Sains Malaysia (USM) and Universiti Teknologi Malaysia (UTM). USM has also been awarded Apex university status.). The four universities under Malayisan Technical University Network (MTUN) are UTHM, UTeM, UMP and UniMAP. The rst public university was established in 1962. Pure science courses (e.g. physics, chemistry, biology, mathematics and statistics) are offered at all public universities but are not commonly offered at private universities. Other specialised courses such as agricultural sciences, forestry, shery, veterinary, agro-based, earth science, marine science, town planning, nanotechnology, aerospace engineering, humanities are available mainly at public universities. Like public universities, private universities are independent institutions or self-funded institutions that award their own undergraduate and postgraduate degrees and conduct a certain amount of research. Some universities also offer diploma and foundation level programmes. The rst private university was established in year 1997. Popular social science courses offered are psychology, communication and journalism. Engineering, medical degree and ICT degrees of various specialties are also popular programmes sought- after by students. In the eld of business, accountancy and nance, degrees are offered with specialisations of various combinations – management, economics, banking or commerce. Private universities also offer many courses in the eld of allied health sciences. As private universities are self-funded and many run by commercial enterprises, the tuition fees are higher than that of public universities. Similar to private universities, private university colleges in Malaysia have the power to award their own undergraduate degrees and postgraduate quali cations. They are smaller in terms of physical size and student enrolment. Generally, university colleges also have limited faculties and specialise in a given eld or elds. University colleges do not focus much on research-based postgraduate programmes but they offer bachelor degree, diploma and foundation level quali cations. Most of the private university colleges have been upgraded from college status. The tuition fees are similar to that of private universities. These universities are invited by the Malaysia government to establish their off-shore campus in Malaysia. There are currently nine foreign university branch campuses in Malaysia,. These universities originate from Australia, China and the UK. They award their own degree (undergraduate and postgraduate), diploma and foundation studies quali cations. The quali cations are identical to that of the host universities. The rst private university was established in 1998. Tuition fees are higher than private universities but are lower than at the host universities abroad. Colleges in Malaysia are independent institutions that award their own quali cations at diploma and certi cate levels, foundation studies, as well 3+0 foreign university degrees and split degrees Colleges also provide tutorial support for professional and semi- professional body quali cations such as ACCA, ICAEW, CLP, LCCI, CAT, GCE A-Levels, etc. College campuses and their enrolment may be smaller than universities. These institutions have no power to award their own bachelor’s degree quali cation. Some of these institutions have existed as early as the 1960s. Tuition fees are generally lower than that of private universities. Note: Public universities can be divided into five research universities, 11 comprehensive universities and four specialised technical universities (MTUN). The five public universities that have been designated as research universities are Universiti Malaya (UM), Universiti Putra Malaysia (UPM), Universiti Kebangsaan Malaysia (UKM), Universiti Sains Malaysia (USM) and Universiti Teknologi Malaysia (UTM). USM has also been awarded Apex university status.. The four universities under the Malaysian Technical University Network (MTUN) are UTHM, UTeM, UMP and UniMAP. There are 399 private colleges in Malaysia as at June 2016. Click here for a list of private colleges in Malaysia. And for a list of courses offered at higher education institutions in Malaysia, please log onto www.studymalaysia.com. Need help deciding which college or university is best for you? Here’s a handy list of items you need to know and consider before applying to study in a HEI in Malaysia. What kind of internship programme does the institution offer? Who awards the qualification? Does the qualification allow you to pursue the career you want? Would you prefer to have the live-in experience of a big university campus or the buzz of a campus in a big city? What kind of facilities does the institution offer? What kind of support does the institution offer to international students? Besides going for classes, studying, and working on your assignments, what kind of student life do you picture yourself having? Does the institution offer you the lifestyle you want? What's the assessment method for the programme?